“For Better…for Worse” Your marriage can survive the worse! 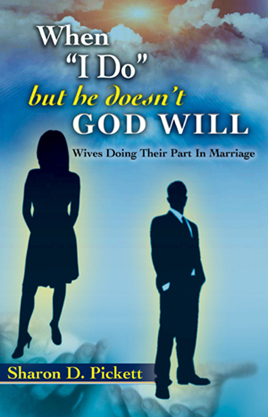 “When “I Do” but he doesn’t, GOD WILL” is a dynamic thought provoking book that uses the Word of God and author Sharon Pickett’s insightful experiences to help women overcome the pitfalls of marriage. Dispelling the stigma associated with being “the weaker vessel,” women will discover the authority that Christ gives to wives through the marriage covenant. Throughout this inspiring book, you will learn biblical and practical ways to salvage your marriage without sacrificing your dignity. Whether married or single, you will discover the importance of being a woman of integrity, excellence, and character. You will also learn how God uses the “help-meet” in shaping your husband to become the man God called him to be. Surely, a blessed and fulfilling marriage can be yours because God wants your marriage to thrive—not merely survive!